If you’re constantly scratching your head because of an itchy scalp, it could be more than just dandruff. Many conditions can cause an itchy scalp — from dandruff to ringworm or something more serious like a bacterial infection or autoimmune condition. Before you can stop the itch, you need to find out what’s causing it. These are the most common reasons for an itchy scalp. “Your body’s inflammatory response to an overgrowth of yeast causes the itching and flaking associated with these conditions. 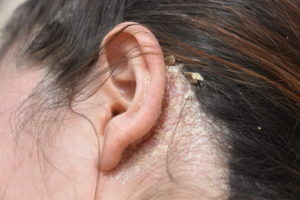 Yeast normally lives on the scalp and other hairy areas of the body, but the problem arises when there’s too much yeast present,” says dermatologist Melissa Piliang, MD. The fix: For mild cases, you can use an over-the-counter shampoo containing selenium or zinc pyrithione — ingredients that help control yeast. For more serious cases, you may need a prescription-strength antifungal shampoo, topical cortisone or medicated foam, solution, cream or ointment. This is a chronic autoimmune disease that causes raised, reddish, scaly patches on the skin or scalp. You can’t get psoriasis from other people. Experts don’t have a clear understanding of what exactly causes this skin disorder, but you’re more likely to develop it if someone in your family has it. The fix: Dr. Piliang recommends trying over-the-counter medicated shampoos containing coal tar or salicylic acid to control scalp psoriasis. If those don’t work, make an appointment with your dermatologist. He or she can prescribe stronger shampoos and topical cortisone. This is a fungal infection commonly known as ringworm, which can infect the scalp. Tinea capitis extends deep into the hair follicle, causing round patches of hair loss that increase in size over time. The rash may appear raised and with black dots or a stubbly appearance. The fix: If you have a ringworm infection of the skin, you can use an over-the-counter antifungal formulation to get rid of it. Not so with the scalp. “Since the organism exists deep in the hair follicle, you’ll need to take oral anti-fungal medications to resolve the problem,” says Dr. Piliang. Your doctor will verify that this is actually what’s causing the problem before prescribing these powerful medications. Although most people think of schoolchildren when they hear about head lice, they can invade anyone’s scalp. Dr. Piliang says that lice prefer clean hair, so having a case of head lice doesn’t mean you have poor hygiene. If you look closely, you can see tiny nits (eggs) attached to individual hair strands. They look a bit like dandruff, but they aren’t easily shaken off because they’re “glued” to the hair shaft. You might also be able to see adult lice moving around the head, but they’re harder to spot than the nits. The fix: You can treat head lice with over-the-counter shampoos containing insecticides pyrethrin or permethrin. “Each head lice shampoo formula has its own treatment protocol,” warns Dr. Piliang. “You must follow the instructions on the box exactly to get rid of the lice.” These work well if you use them as directed. Hair dyes, eczema and atopic dermatitis are other, less common causes of itchy scalp. The fix: Allergic reactions will generally go away on their own if you can identify and avoid the chemical to which you are allergic. This is challenging and specialized tests in a dermatologist’s office may be needed to sort out which chemical is causing the allergy. Dr. Piliang says that it’s always a good idea to see your dermatologist when you have a persistent itchy scalp – even if you think it’s just common dandruff. Your dermatologist can check it out and tell you which remedies will bring you some relief.